Namaha means we bow or show reverence. The Goddess, also known as the Goddess of Arts and Knowledge, is described as a beautiful woman to embody the concept of creativity and knowledge as supremely alluring. She is the daughter of Goddess Durga and Lord Shiva. It is thoughted that the Goddess endows human beings with the powers of speech, learning, and wisdom. She has 4 hands representing 4 aspects of human personality in learning: intellect, mind, alertness and ego. The Goddess has holy scriptures in one hand and a lotus – the symbol of true knowledge – in the second. 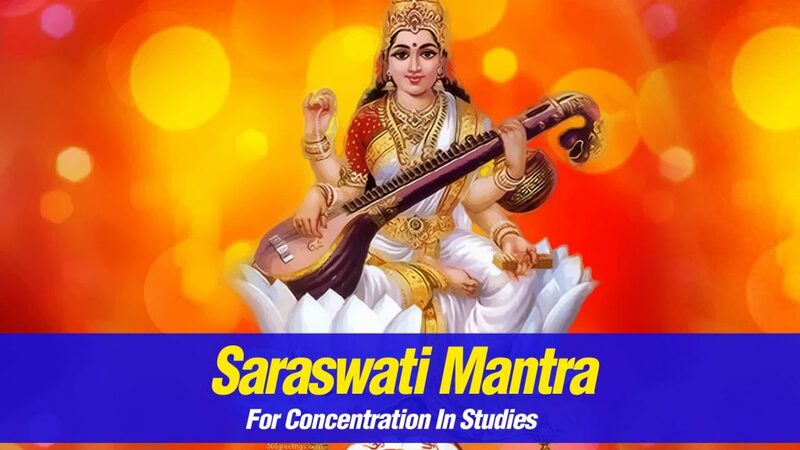 The earliest known mention of Saraswati as a goddess we can find it in Rigveda. The Goddess has remained significant as a Goddess from the ancient Vedic period through modern times of Hindu traditions. A few Hindus celebrate the festival of Vasant Panchami (the 5th day of spring) in her honor and mark the day by helping young children learn how to write alphabets on that day. The Goddess is also adored and revered by believers of the Jain religion of west and central India, as well as some Buddhist sects. In Shanti Parva of the Hindu epic Mahabharata, The Goddess is called the mother of the Vedas, and later as the divine creative symphony who appeared when Brahma created the universe. In Book 2 of Taittiriya Brahmana, the Goddess is called the mother of eloquent speech and melodious music. She is the active energy and power of Brahma. The Goddess is also mentioned in many minor Sanskrit publications such as Sarada Tilaka of eighth century AD. This amazing mantra illuminates the minds of those seeking knowledge be it related to the spiritual world or educational field. This mantra is considered to instill confidence and imparts strong communicative skills. Also, chanting this mantra helps in developing our speech and memory, removes Vani Dosha and helps us in making the correct use of our words. Dedicated chanting of the mantra can help a student pass his exams with flying colors and a job aspirant to clear his interview successfully. Even those aspiring to go in for higher studies and research work can benefit immensely from regular chanting of the mantra. Artists, writers, poets and public speakers can grasp new heights of achievements with the help of this mantra. As a general practice you can recite the mantra daily for minimum 108 times out, while focusing your attention at the point between your brow (ajna chakra). Your eyes can be slightly turned up but it shouldn’t cause you any strain. If you like you can also visualize the Goddess in your mind eye. This entry was posted in Hindu Mantras on February 11, 2016 by admin.